Bought this for the cover, plain and simple. The guy is a hottie. Totally. The guys get better and better looking with each series this author does! There is another series by this same author that I will be reviewing soon too. 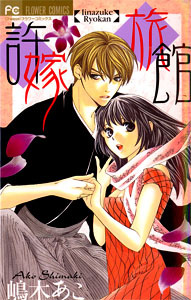 This volume contains three one-shot romantic stories. I am a total drooling fangirl over the guys in this. They are cute and surly 😀 The cover story takes up a little more than half of the book. It’s the heartwarming story of Sanae who has travelled to the countryside to a very beautiful old (and expensive) traditional Japanese hotel (a Ryokan). She is engaged to Shinichiro, the son of the owner. It is an arranged marriage, and Sanae hasn’t even met him yet. On the way to the Inn, Sanae gets a little lost in the woods, but is saved when she encounters Ryosuke, a very handsome (but surly) guy who who works at the inn. He leads her there, but along the way Sanae manages to nearly kill herself and Ryosuke when she stumbles and falls. Ryosuke saves her (again) and they finally get to the inn. Sane is shocked when she meets her fiance for the first time. Shinichiro looks remarkably like Ryosuke! However, his demeanor is completely different. Where Ryosuke is surly, Shinichiro is friendly. He likes sweets while Ryosuke hates them.